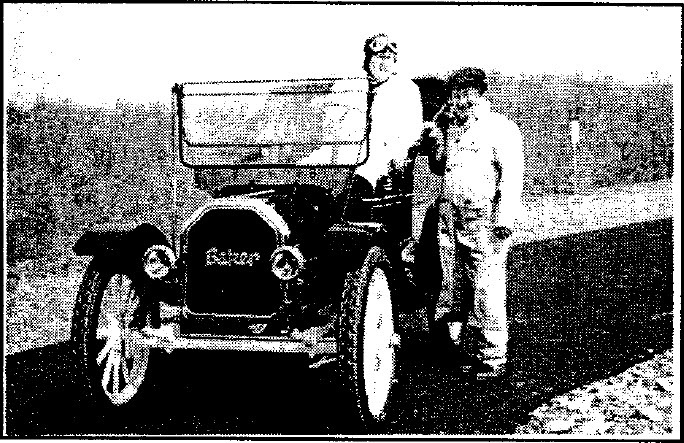 Ray Carr, Driver and Mike Wyka, Engineer-Crew Chief, on a test run in Pennsylvania before the record runtrip ever made by an antique electric vehicle. Carr set out May 28 from Astoria, OR, averaging just 18 mph and 101 miles a day in his slow-paced marathon across 14 states. To set the stage for this year’s home-stretch run across eastern PA and NJ, Carr pulled his little car up in front of the state capitol in Harrisburg, PA, at 12:45 pm Friday and met with PA Governor Tom Ridge. Ray Carr breaks banner at Harrah’s, Atlantic City. On Monday, July 3, filled with emotion, Ray Carr rounded the turn in Harrah’s baywalk towards the finish line. The crowd was a sea of onlookers sporting Coast­to-Coast ,T-shirts. 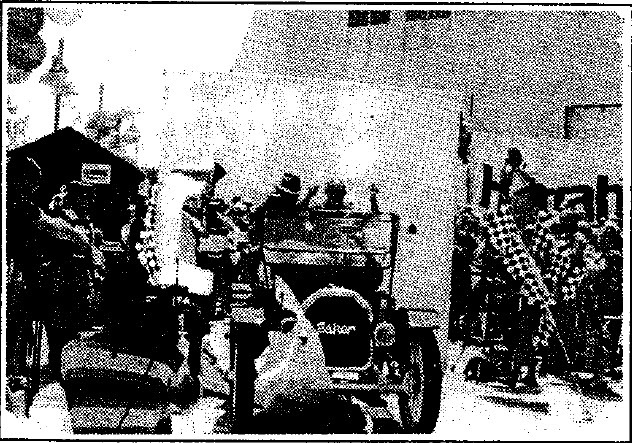 To the patriotic beat of the Stars and Stripes, Ray steered his ELECTRIC carriage past a corridor of cheering, flag-waving folks, stopping to hug and kiss his grandchildren, all bearing a flag from a state on Grandpop’s transcontinental trek. 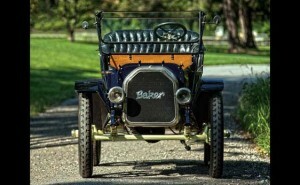 He burst through a paper finish line banner on the boardwalk at Harrah’s marina at 11:00 a.m. Monday, July 3, to end the historic 3,300-mile trek in his midnight-blue 1912 Baker Elec­tric Runabout. A medley of media,ABC, NBC, CBS, FOX-29, CNN, NY Times, The Inquirer, Atlantic City Press, AP, New Jersey Network, Channel 17 – Inquirer News Tonight, and WCOJ/Suburban Cable from Chester County poised their cameras and microphones to record the historic finish. BRAVO! The man with a dream, and his ELECTRIC machine, burst through the check­ered banner. With microphones thrust at him, Ray was pelted with questions from the press. 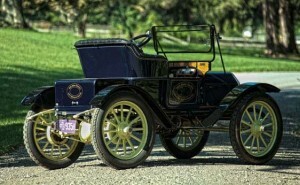 This feat put Carr in the history books for making the first ever coast-to-coast trip by a factory-built electric car,the first by an antique electric and one of only a few by any type of electric-powered vehicle. While Carr made his trip last year just for the fun of it, he saw this year’s quest as having potential long-range significance for the American driving public. 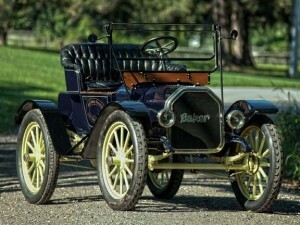 Carr’s Baker Electric, a battery-powered car, enjoyed vast popularity during the first two decades of the 20th Century. With pollution an increasing concern, EVs may well herald the future of 21st Century motoring. Only EVs are able to meet the tough new anti-pollution stan­dards of a CA law scheduled to take effect in ’98. 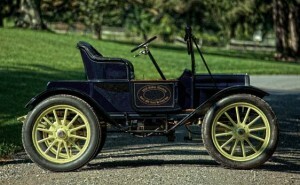 Today, as it was when it rolled out of the factory door in 1912, Carr’s little Baker was powered by Exide lead­acid batteries. A Curtis PMC controller, an Advanced D.C. motor, an Albright contactor, and gauges were sup­plied by Electric Vehicles of America, of Maynard, Mass. 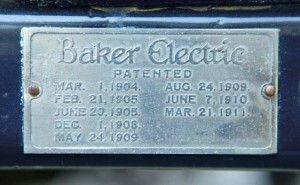 and the charger was supplied by Norvik of Ontario, Canada. 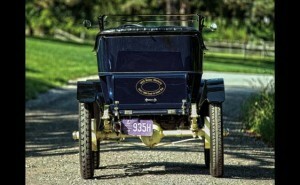 This historical run gave Carr his second world record in as many years for transcontinental travel in an an­tique vehicle. Last year, he drove his way into the Guiness Book of Records by crossing the United States in a 92- year-old, one-cylinder, five-horsepower, gasoline-pow­ered Northern Runabout named “Chuffie,” the oldest au­tomobile ever to make a coast-to-coast trip.